I was at a party and they had an antipasto platter with marinated artichoke hearts. I loved them and started using them in salads and pastas. They are so versatile and can be used in so many ways. But I noticed a few things when I was looking for some in the grocery store. Firstly, they are expensive. Expensive small bottles. Costco had big bottles but that brings me to my second thing, they are very vinegar based. Vinegar is cheaper than olive oil, and even then, most bottles I saw were using canola oil. So I thought to myself, surely I can make my own with good quality ingredients. Add olive oil and garlic to a pot on medium heat. Once it starts to boil reduce heat to a simmer and add the white wine vinegar. Add lemon peel, rosemary, oregano, chili flakes, and salt. Drain artichokes and chop. You can keep them whole if you desire. Add to pot and simmer for 10 minutes. In a sealed jar, pour olive oil into it just cover the bottom. 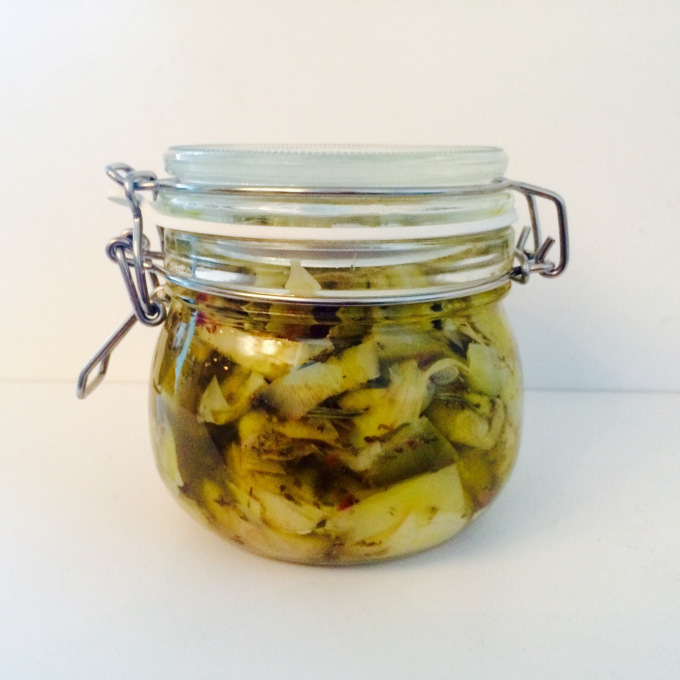 Spoon artichoke marinade into the jar. Finish with olive oil, pouring in enough to cover the base so all the artichokes are under oil. I chose to go Italian with my spice mix and of course I spiced it up. But the dried spices can be anything you choose. I also chop the artichokes into small chunks so it’s ready to go for my salads, pizzas, pastas etc. but you can halve them or keep them whole.